When Maya Kurinoki takes her little brother to the local ice-skating rink for the first time, she's got her hands full just trying to get him to let go of the bar. To inspire a bit of bravery in him, she attempts a double axel-and lands it! Maya never imagined that this jump would change her life... or that a coach named Eishi Todo would vow to make her a figure skating "princess"! Now all Maya has to do is convince famous skater Shun Kano to become her partner. Too bad Shun doesn't want to have anything to do with her! 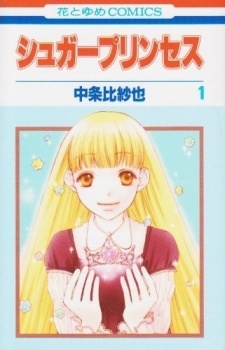 Sugar Princess was published in English as Sugar Princess: Skating to Win by VIZ Media under the Shojo Beat imprint from August 5, 2008 to November 4, 2008. A short 2-volume manga by the same author of the well-known romance, Hana-Kimi. The story revolves a girl, Maya, who has a growing talent - skating. She starts out at a public skating rink and does an advanced skating technique for the first time just from watching it on TV. Coincidentally, she is spotted by a guy who wants to pair her up with a more advanced skater, Shun. He is at first arrogant and cold about having to be her coach. The story progresses with her practicing, learning, and bonding with Shun. The plot is predictable, but you can't expect too much out of a 2 volume manga. Art: appealing and flows with the story. I've always loved Hana-kimi art so I knew I wouldn't have a problem with this one. Characters: again, a 2 volume manga doesn't have much room for character development, but there is some. Shun is like Sano from Hana-kimi, doesn't like to open up but in the end he does. His friend Oda reminds me of Nakatsu because of his carefree personality. The confident Maya reminds me of Mizuki. I don&rsquo;t know if the author meant for this to happen but if you read this you'll see the connection. Enjoyment: I really liked it. Although the characters were not as original, the concept was. There aren't many skating manga so I give props to Nakajo for doing this project. Also, I took lessons for 5 years so I was interested in how she was going to play this out. She really did her research, though. Overall: your typical shoujo, worth a read. First off, I'm surprised how few manga revolve around figure skating- or at least few are commonly known. I picked this up for the sole reason that I really wanted to read a manga about this sport; I wasn't disappointed because my expectations weren't extremely high. A two volume series is not going to leave much in the span of character development and plot development. It was okay- though nothing it was extraordinary, it's worth a read for those interesting in figure skating. The premise of a young girl starting figure skating as a teenager is appeals to me- I like a main character discovering they have a lot of potential in something but are very unpolished in the subject. Maya has raw talent and natural rhythm/balance. She puts a great deal of effort into improving and it pays off at the end. The end, however, is not only very predictable, but it felt anti-climatic. This might have had to do with the short amount of chapters. The characters are mostly interesting despite the fact that there is not too much depth. In fact, I would've liked to know a lot more about Maya by the end. But her personality is amiable- she's not energetic to the point of being annoying but she has a lot of spirit. Shun is likable enough- he's the classic cliche of a unresponsive partner in the beginning who warms up to the protagonist as the story goes on. I wasn't crazy about him by any means, but I also didn't mind him. The other characters are not touched on much at all, leaving the reader a bit apathetic to some of the relationships. I did like how romance wasn't a big play at all to this manga- it really focused on the sport and the goals of Maya rather than typical shoujo affairs. Since this is such a quick read, I'd recommend it to someone who feels like a bit of ice skating. All in all it was a typical shoujo manga...it was not the worst..but it had potential to be so much better. Maaya is level headed, friendly, hard working, independent and all around lovable. Better yet, she doesn't think with her hormones. While she did acknowledge Shun and Kuze was "pretty" and prince like, she didn't have the typical shoujo heroine reaction. Maaya thought her decision through, when she first gotten scouted to skate. What to do about the money issue, skate uniform for her competition and contrary to all, she did not hit her parents up for money (standard response by teenagers). Guys like Shun are plentiful, with their gorgeous appearance, cold personality and whatever smart/skills. Especially, in the shoujo section. But good girls? Apparently not that many.